If a hotel rich in scandal, secrecy and conspiracy peaks your interest — the Cliveden House is certainly the perfect getaway experience for you. Built in 1666 by the 2nd Duke of Buckingham, as a gift to his mistress, Cliveden House is filled with endless iconic stories and still oozes decadence, elegance and glamour just as it has done for the many distinguished guests who have stayed—and partied—here over the past 350 years. It’s truly unlike any other hotel thanks to its unique personality, which is exhibited throughout each of its rooms. The rooms and suites at Cliveden have each been named after a prominent guest from Cliveden’s history and have all been restored to their full glory, with beautiful craftmanship, stunning interiors and all the comforts and luxury that befits a house like this. The hotel’s opulence is exhibited throughout the interiors: endless paintings, ornate tapestries, and shiny suits of armor. The rooms are grand in every way possible, with the most spectacular silk touches throughout. Despite the formal style and the grandeur of the great hall, the house holds a relaxed and the most inviting feel, thanks to the friendly and easy-going service from the decade-seasoned staff. Like all the best house parties, Cliveden’s entertainment doesn’t stop when you go outside. The exterior of the hotel is surrounded by the most beautiful well kept gardens and lawns with sculptures surrounded by woodland maintain and intimate feel. Cruise on the River Thames with champagne in hand, swim in the world-famous outdoor pool where John Profumo first saw Christine Keeler, or spend an afternoon relaxing in the brand new spa that’s tucked away behind mellow brick walls of the garden. There are no shortages of activities, from guided walks to clay shooting, tennis and golf, Cliveden House has it all. On the dining front, there are two restaurants on property. One—much like the rest of the hotel—is quite elegant and formal, while the other is a more casual option. The food at the former is outstanding with an even more incredible wine pairing from the new young, innovative sommelier who brings in wines from small, organic producers and from the more off-the-beaten path wineries. The latter is located in a former stable and is very chic—reminiscent of an Hermes-style decor. Just 40 minutes from central London and 25 minutes from Heathrow Airport, Cliveden House is the perfect country retreat. 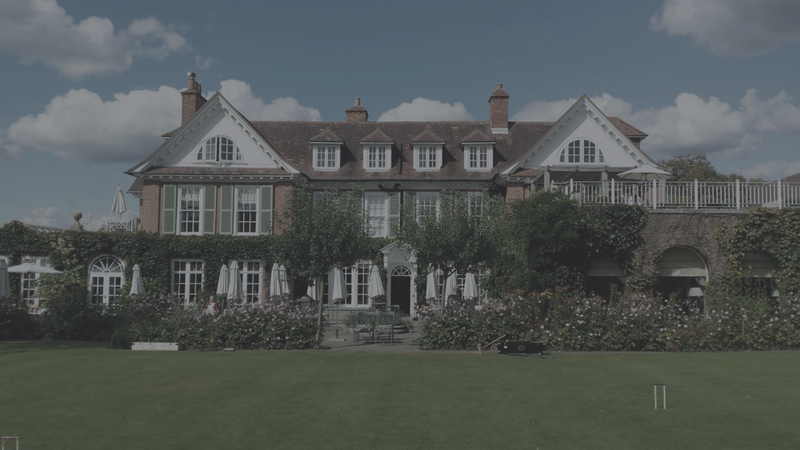 Find hidden gems in the gardens, explore local towns like Windsor and Henley and be charmed, as much by the enchanting surroundings of the house, as by the house itself. Located just two hours from London and set near the coast in Hampshire, Chewton Glen is a stunning manor, spa, restaurant and country club that perfectly combines old-school elegance of the Jeeves & Wooster era with stylish modern touches and updates. Chewton Glen is nothing short of a memorable countryside escape suited for families, couples seeking a romantic getaway, or even a weekend with the girls. Perfect at any time of year, this hotel ensures that every guest with experience ultimate luxury: from the relaxing pools to the award-winning thalassotherapy spa, and even to the many activities for those looking to explore their adventurous side. The center of the property is a beautiful country manor with a main restaurant and many rooms, but the most notable aspect of this property is undoubtedly the intimate Treehouse Loft Suites, a truly luxurious elevated experience in the most literal sense. The suites and rooms throughout the hotel are comfortable, spacious and beautifully decorated for the benefit of the guest. The hotel does a wonderful job accommodating and attending to the needs of each and every guest. But there is no denying that the Treehouse accommodations are everyone's favorite. Where else can you spend your night with your head literally in the clouds tucked away in a private wooded area? There are about 4 variations of the treehouse suites each carefully designed for either a large family, a family with small children or the ultimate romantic experience. Each treehouse is equipped with a fireplace, kitchenette and outdoor hot tub on the private terrace. Every morning, breakfast is specially delivered straight to the Treehouse — and it does not get much better than this. The Treehouse Loft Suites are perfect for children, as they come with an actual loft for them to play and sleep in. If you’re longing for a hideaway with your loved one, the Treehouse Hideaway Suite takes privacy and romance to new levels — and there’s nothing more special than watching the sunset from the comfort of your own private hot tub on the terrace. The large 130-acre property is surrounded by many beautiful gardens and greenhouses, which are perfect for exploring. The food and beverage options at the Chewton are delicious; the menus feature typical English dishes with modern creations. Needless to say, the dining is just as unforgettable and all the more enjoyable for children of all ages! The Kitchen is their newest addition, where you can enjoy the once-in-a-lifetime experience of taking a class taught by a celebrity chef, using fresh ingredients taken right from the property. The hotel is very well-suited for children, even those who need many activities to keep them entertained as it's equipped with endless amenities & activities to maintain that family-friendly feel. With an indoor and outdoor pool, hiking, biking, horseback riding, and tennis facilities — what else could you possibly need? Plus, it’s just a short walk from the beach at the English Channel. A stay at the Chewton Glen is a guaranteed ultimate luxurious experience that will have its guests talking about their visit for years to come. Be it a family vacation or a romantic getaway, there will be plenty of time to relax, explore and indulge in an amazing experience!